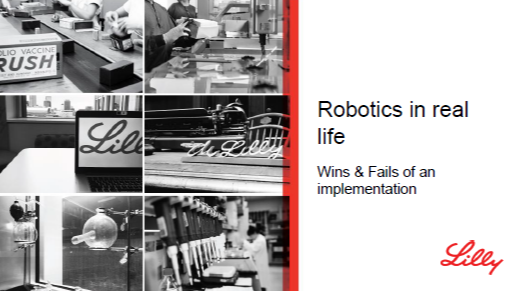 Christopher Oehlschläger, General Accounting Global Process Owner, Global Business Solutions at Lilly Deutschland GmbH, offers his presentation about Robotics in Real Life - Wins & Fails of an Implementation for free. Get insight to his expertise and apply it to your own business needs. He will address hot topics questions and points that impact success like environment, in-house RPA CoEs, process selection and design, main targets for RPA use, expectation management and more!